The Jurassic adventure is the ultimate adventure inflatable. Your kids will imagine themselves, entering the ancient bone yard of the Wooly Mammoths, then climbing up to the top of an active ancient rocky volcano, and when it get too hot they escape by sliding down the 10 ft slides. Then they can ride one of the 4 rocking pop up dinos.It's an adventure they will never forget! With 15 to 20 kids at a time, the Jurassic adventure can entertain a large crowd for many hours. 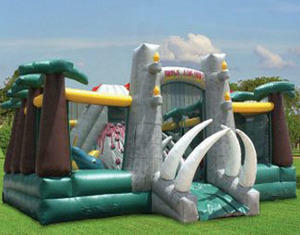 The Jurassic Adventure™ is the perfect item for any school, church, corporate event or company picnic with lots of kids.